Pictured are all this year’s participants in the Preble County Rotary Club’s annual 4-Way Speech Contest. Arica Hamilton, a student from Eaton High School, came away with the win and moved on to district competition. EATON — The annual Preble County Rotary 4-Way Speech Contest was held on Monday, March 4, with six students representing three Preble County school districts taking part. Participants included Ben Bitner from Twin Valley South; Rebecca Wright, Arica Hamilton, Andrew Brooks and Ella Bruce from Eaton High School and Mark Armstrong from National Trail. Bitner spoke on the state of the agriculture industry and promoted government aid for new farmers; Wright spoke about the animal cruelty of the practice of vivisection, Hamilton’s topic was the proposed solar facilities in Preble County, Brooks asked if agri-science education “is worth it?,” Bruce spoke on the difference between organic and non-organic foods and Armstrong shared his thoughts on learning and growing from personal life experiences. Hamilton took first place and received $200; Brooks took home second place and $150 and Wright received $100 for her third place finish. Rotarians Shawn Hoff, Bruce Barnes, Joe DeLuca, Brenda Latanza and Mike Raymond served as judges for the contest. Hamilton moved on to the District Rotary 4-Way Speech Contest with her local win. One of the world’s most widely printed and quoted statements of business ethics is Rotary’s 4-Way Test, which was adopted in 1943. The 4-Way Test was created in 1932 by Rotarian Herbert J. Taylor, who later served as Rotary International president, when he was asked to take charge of a company facing bankruptcy. The 24-word test for employees to follow in their business and professional lives became the guide for sales, production, advertising, and all relations with dealers and customers, and the survival of the company is credited to this simple philosophy. Those participating in the 4-Way Speech Contest are charged with putting a topic of their choice to the 4-Way Test. 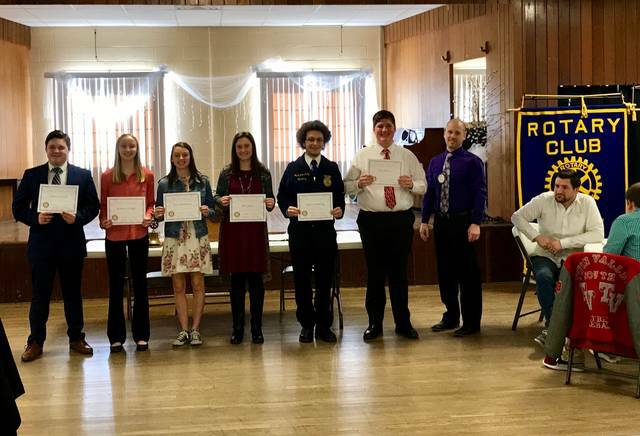 https://www.registerherald.com/wp-content/uploads/sites/41/2019/04/web1_4_Way_Participants.jpgPictured are all this year’s participants in the Preble County Rotary Club’s annual 4-Way Speech Contest. Arica Hamilton, a student from Eaton High School, came away with the win and moved on to district competition.